This is a surprisingly simple recipe which can be put together in a matter of just minutes of active cooking time. Don't let the seemingly long list of ingredients and sub-recipes fool you. It is EASY. Though this is absolute heresy, you could use left over steak and make a small batch of sauce on its own. I did that earlier this week and it was quite surprisingly good, though the texture of the meat differed from the true Italian beef sandwich. I'm not sure if other cities or regions offer anything exactly like Chicago style Italian beef sandwiches. Sure there's French Dip, but the specific taste of the Chicago is unique. I guess owing to Jay Leno, people outside Chicago now know a little about it. 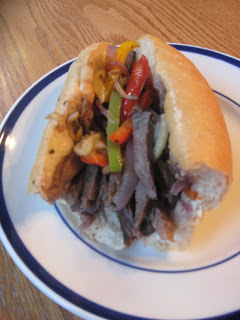 the two key aspects of the style are that the roll is soaked in beefy "juice" prior to serving, and the pepper toppings are fairly unique to the sandwich. There are two Chicago style approaches to the toppings, roughly. Of course, many people put both on the same sandwich. Hot - which means giardiniera, a spicy mix of peppers, onion, cauliflower and other vegetables. Even "mild" giardiniera is fairly spicy. Sweet - which implies pan roasted bell peppers. Usually green, sometimes green and red. I had some giardiniera on hand, but Margie and the kids would probably pass on the spicy version. In fact, most of them would pass on the sweet version too, but whatever. So I went "High End Sweet", and slowly cooked onion, garlic and fennel with red, orange and green peppers. I added a few fennel seeds, dried oregano (bowing to local tradition) and hot pepper flakes. It looked like this, and was delicious. 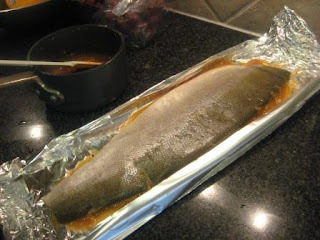 --- Combine all ingredients and marinate for 4 hours or overnight. --- Let beef rest at least 30 minutes, or chill in fridge. --- Cut paper thin slices, preferably with an electric slicer. If you don't cook the roast beef, and use leftover steak slices, use this recipe for sauce. --- Bring sauce ingredients to a boil in a small sauce pan, then simmer while making peppers. --- Add beef to sauce and let sit over low heat to warm through. --- To serve, use tongs to place beef into sliced rolls. The rolls CANNOT EVER be toasted, just in case anyone from outside Chicago gets any crazy ideas. --- Spoon additional sauce over the sandwich to make it as "dry" or "wet" as you prefer. --- Top with a generous portion of the mixed peppers. Menu? We Don't Need No Stinkin' Menu! You know that old saw, there's only one rule - there are no rules. It's pretty true for cooking. You can do anything you want. However, I do recommend that you focus on developing fundamental techniques, use high quality fresh ingredients and let a small number of good recipes help you along. Last week I touted the value of a weekly menu, then gave a little update or two along the way. It was a great approach for our family. We had many fresh, interesting meals last week from that menu, then followed it up with hosting almost 30 people for a Homecoming dinner. Monday, we even had a little Bears-Packers Monday Night Football party, and a decent approximation of an Italian beef sandwich. There were a few changes along the way. Not a big deal, but I substituted one vegetable for another, made a second batch of mac and cheese because the first one was too spicy for some eaters, and changed the leftover night to earlier in the week. Actually, we had too much food, too early in the schedule. Then we had food leftover, as we headed into our weekend schedule, which differed from the prior weeknights. I hate having too much on hand then wasting food if it's not eaten in time, but it happened. The menu I composed was pretty darn "high end" in the sense that there were not one-pot meals, convenience foods, and I challenged the kids a couple times with specific ingredient or flavor choices. I think if there was one "staple" or a dish that would "stretch", the overall menu would have been more powerful and efficient. Wed: grill a simple meat and serve it with salad, vegetables and pasta (adding leftover sauteed pepper and onion from Monday's sandwiches). Thu: Swim meet at 6pm. We'll munch on leftovers and sandwiches. Fri: kid's sleepovers, a happy hour and an evening party. We'll probably warm a pizza. So where's that high-falutin menu planning now, you ask? Dare I say "every other week"? Yes. Sort of. If last week's menu were simpler, we'd probably do something like that again. If this week weren't so hectic outside the house, we'd cook more elaborately. The amount of menu planning kind of reminds me of how a baby or toddler eats. They might eat vegetables for five meals in a row, spitting out all other food offerings. Then for the next few days they'll eat nothing but fruit and meats. In the end, it doesn't matter too much, as long as over a shortish period of time, they get enough vegetables, fruit and meat. I don't have an exact number in mind, but it you were to cook a fresh meal, say 12 times a month, you'd be cooking and eating well. Picture leftovers for most (say 9) of those meals, a few nights out - either dining or grabbing something quick on the run (like a pot luck dinner for the swim team) - and a few nights of truly convenient cooking. Like sandwich night. Or baked potato night. Or breakfast for dinner. Do the math and you've eaten quite well all month long. And having a menu for the upcoming week, even it it's kind of loosely organized, will go a long way toward cooking that often. So actually, you do need a stinkin' menu. Here's a last story to demonstrate. I was in the grocery store yesterday and saw a 30-something mom with two preschool aged kids in her cart. She only had about four items in the cart (yet a quarter of the way through the store), no shopping list, kids climbing all over the place, while she stood motionless, apparently thinking about what to make for dinner. No shopping list, anxious kids. Apparently, no plan. That doesn't help making cooking enjoyable. Be prepared. Earlier today I was thrilled to learn that my Kindle readers have propelled my commentary here on Be A Better Cook to the #1 ranking in the Food and Wine category, though it might be a briefly held spot. Maybe more so, being #44 out of 4852 blogs in Lifestyle and Culture and #32 out of 2860 blogs in Arts and Entertainment also make me proud to share my thoughts with the world. THANK YOU very much for reading what I have to share. On the other hand, it's been a full week since you last read something here. Why? Well, I've been cooking. Like crazy.It will be another day or two until you see the next "instructional" installment of Be A Better Cook. For entertainment, not insight nor instruction, I'll share the details in a separate entry tonight, outlining a crazy menu I served this weekend to eleven high school sophomores and about twenty of their parents. However, this note also gives me the opportunity to encourage you to send me questions or feedback. Just drop me a note a tmcguff@gmail.com. I'd enjoy hearing from you. "I Need A Signature Signoff Phrase"
If you also read my blog "What Tom Cooked", you'll have seen this entry. If not, and you'd like a little insight into what I cook for my family each week, you might enjoy the other blog. It's a personal journal of sorts, where a few times a week I capture menus, recipes I create, or the sources I used to cook from. It's available on Kindle in the usual manner. I apologize, though, that it's $1.99 / month. amazon sets the prices, not me. Here's a little potential entertainment to tide you over until the next typical installment of Be A Better Cook. We've started a tradition of over-the-top Homecoming Dance dinners served at our house for our daughter and her friends. Last year's theme was "Looks like a kid's menu", in which each dish that seemed like it was from a child's menu, was really a high-end gourmet interpretation. For example, PB&J was inspired by Grant Achatz's brioche wrapped peeled grape with almond dust. The highlight of this year's menu was over ten pounds of fresh tuna, caught by Nora's friends Amanda and Lauren during their recent vacation to the Pacific coast of Costa Rica. Their father Chris, who has business connections to Brazil, also suggested serving Picanha, Brazilian style skewered steaks. For this surf and turf entree, we'd carve the steaks off the skewers tableside. ** Penguin Pops and Krill Burgers were a serious consideration, but ruled out based on international law. Much like last year, once the quests arrive there's little time for taking pictures. I snapped a couple, mostly of ingredients in process, not finished dishes. As I get more pictures from the other families, I'll add to the small collection below. So How's My Menu Working Out? In the last post, I shared my family's menu for this week. You can tell that sometimes I get a little over-eager when I plan a menu. I also had a little flexibility built into the plan, just in case. Here's what I really made, so far. Salmon with pineapple glaze. Check. Nora and Alex didn't like it. Homemade Mac and Cheese. Awesome, but pepperjack cheese dominated. Alex didn't like it. 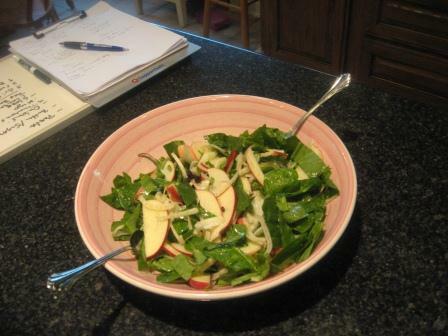 Fennel, Apple and Spinach Salad. One of the best salads I've ever made, I think. A little left over for Sun. More spinach, apple and fennel if a new batch is needed later in the week. Steamed fresh green beans. Check. Don't know why I put carrots on the original plan. I bought beans. Not many people were able to make it over for the late night football game, so vodka tomatos and tortilla pizza were dropped. But, I did make a big batch of my nutty dried fruit granola to use for breakfasts for a couple weeks. Homemade French Onion Dip. Check. Too bad the Hawkeyes weren't as good. Another batch of mac and cheese, no pepper jack. Check. Burgers added to menu. Three burgers added to make Alex happy, since he didn't like much of last night's dinner. He also ate steak. Growing boy. Grilled asparagus. Excellent. Leftover green beans, leftover salad. Made 6 sandwiches, prepped 6 portions of fruit, made three tomato/cuke/pepper salads for school lunchs. Covers 2 days. Watched a lot of football, went to pool with Alex and Amy. Dropped them off at CCE. I have not spent the last two days cooking. Really. Amy (age 7) wanted a picture of the plate she arranged. 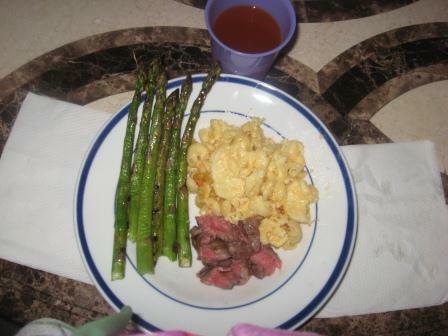 That would be grilled asparagus, homemade mac & cheese, strip steak. She sees me take a lot of pcitures of food. New plan for Monday - LEFTOVERS. Move Monday's pork and rice to Tuesday. Since there's no cooking needed today, I'll prep the batch of yellow cherry tomatoes. Can you eat vodka marinated tomatoes for school lunch? I mean, for a teacher. Probably not. A couple days ago I recommended making a menu plan for a few days or week ahead, to be better organized, save time shopping, and even save time thinking about meals. Margie and I just reviewed the sales at the three grocery stores nearby, picked out entree items that were mostly on sale, and came up with a menu that will probably take us through the next six-seven days. So I thought I'd share (prove?) what came out of our planning process. 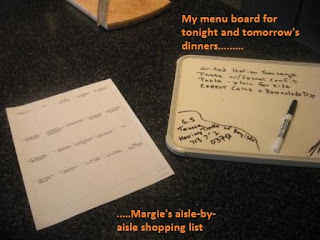 Note: last night I polled each of my kids and Margie to ask what they wanted to eat this weekend, so this menu combines their requests, along with sales, and some decent recipes I came across or will invent. Saturday Late-Night: Iowa-Arizona Football Game - Go Hawks!! --- Turnips and celery root look like tiny potato cubes to my kids. --- A lot of carrots make it look appealing to the kids. --- The lentils are a tough sell. We'll see. The vinaigrette will help. Disclaimer: I don't expect that too many people cook a menu like this each week. Even for us, it's a bit high-end-ish. But, these recipes are simpler than they read in most cases. Also, last week, I was close to underplanning our menu, so this week I'm going a little 'heavy' with the planning. Also, this will be during a week where my two older kids will mostly eat at 8pm after 5:30-7:30 swim practice every day, along with gymnastics, a scout meeting, a school open house, a guitar lesson, an orthodontist appointment, 15 kid's lunches, with Margie working from 6:45am to 5:15 pm and me working at home from 8:15am to 5:15pm every day. Typical week. I'll cook from 5:30 to 6:30 or :45 on Mon and Thursday under this plan. Bragging? No way. Ccommiserating a little. Mostly describing. And also encouraging you to cook from scratch, to find a way to schedule it into your week, and to enjoy the benefits of fresh, home cooked meals. It does a body good. In this recipe I use a number of the suggestions put forward in my last post "Cooking Healthy Meals In Less Time". On one hand, this recipe is very simple, as it only has a few ingredients - fennel, onion, garlic, fennel seeds and red pepper flakes, which are then tossed with pasta and paremsan cheese. One the other hand, there's a very exact method and very specific choices of ingredients that make this a really, really nice dish. Particularly, the choice of products, as I'll describe below. 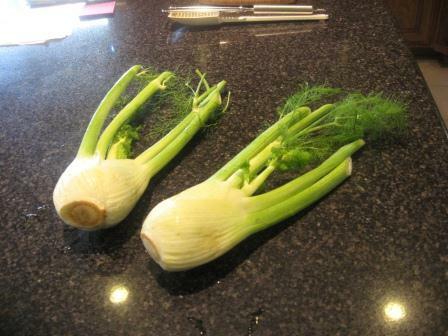 Bought very high quality fresh fennel at a specialty market over a week ago. Fresh fennel lasts for a few weeks refrigerated. It's massively overpriced at my local store ($4+ per) and often beginning to show browning. I get a better value ($1.50-unbelievable) at the specialty store, not to mention great freshness. Used the fennel confit for exotic pizza night last Friday. Plenty of fennel confit left over, so I reused the fennel confit to build this pasta dish. Used a good recipe (at first). Starting from someone else's recipe years ago, I began making this fennel confit. 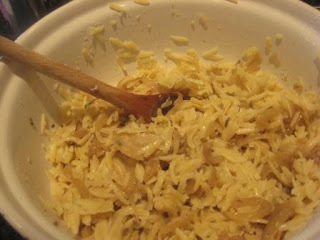 Not that the prorportions are critical down to the teaspoon, but the contribution of fennel seeds and crushed red pepper (not my idea) is what makes it really good. You can now use my recipe. Go ahead, try it. Used a very reliable technique, which I've performed many times. Onions build an incredible complexity of sugars when cooked slowly over medium-low heat (alone or with fresh fennel as in this dish). Mostly unattended, the onions cook for about 35 minutes. Used the same brand of orzo pasta I've used for 10 years - Barilla. 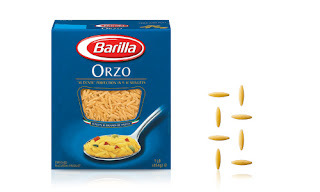 When the box says "al dente in 9-10 minutes", I KNOW that I will cook it for exactly 10 minutes, in fact, in the same pot I always use for orzo, and it will be perfectly done. I almost don't need to taste test it - but I do anyway. Used a high quality parmesan that runs around $15/lb. It has that salty, almost gritty dry taste. It's also flavorful enough that I don't need to use all too much. Only about an ounce (or less). 1 large fennel bulb, green parts trimmed, sliced. --- Combine in a large skillet over medium medium-heat, cook for 5 minutes. --- Can be used immediately, or cooled and stored for up to a week, refrigerated. --- Combine hot pasta with fennel confit and cheese. --- Adjust seasoning with more salt and pepper if needed. "Cook Healthy Meals in Less Time".....That's the promise you are given by virtually any cooking show or magazine these days. As many of you have read over the past months, I'm not making that promise here. Instead, you're getting information from me on how to cook better. That is, at a higher level of quality based on the ingredients, recipes and techniques I share. On the other hand, if you try some of my recipes and techniques, you will get faster in the kitchen. How? Use high quality kitchen tools (and sharp ones for cutting).....so the tools make the job easier for you. Here's an overview on using a good chef's knife. Find good quality ingredients .....find favorite brands and only use them, so the products are predictable and reliable for you. High-end, pricey is not necessarily needed, just good quality and consistency. For example, Barilla dried pastas. Ensure your produce, meats and seafood are very fresh.....This eliminates uncertainty about ingredients you're using ("Does this smell OK to you?") and the hassle of working around bad spots or questionable textures. Have a great, reliable recipe.....so you can focus on just making the dish, instead of second guessing/modifying/improving an average or poor recipe. There are also a few habits you can develop before you even get into the kitchen that help you save time when making better meals. Plan complimentary dishes.....for example, be ready to use similar ingredients during the same week, or use leftovers for a next dish. We'll be using turnips twice in the next 3-4 days. Last Saturday's marinated tomato salad become part of Monday's homemade salsa. Leftover baked potatoes became Silky Mash (an incredible dish). Organize your shopping list.....My wife Margie has a list organized aisle-by-aisle for her favorite store. I choose to simply group produce, bakery, dry goods, meat/seafood, dairy into sections on this list. If you have children, did you ever think that you would make your own baby food, only serve organics, or swear you'd never serve them frozen vegetables? If you're like me, and many other people, crazy thoughts like this crossed your mind. After reality sets in, we tend to cave in to these idealistic visions. Especially when child #2 or #3 arrives. If you're the exception, I applaud you - well done. In our house we couldn't sustain those baby food and perfect vegetable ideals. But we have successfully been able to improve on lunch meats. Lunch meat, you say? How random. Not really. Three kids, one teacher, five school days, twenty sandwiches = lunch factory. And a costly factory at that. Only buy deli items if they're on sale. Create sandwiches that actually taste like the ingredients are supposed to (especially turkey). 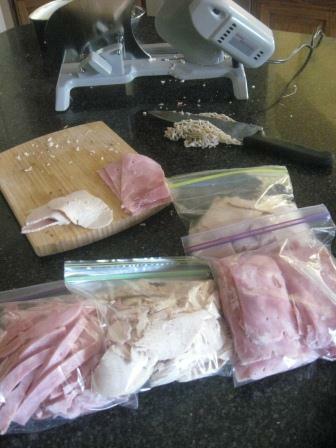 OK, once or twice a month I pull out an electric slicer and work through a canned ham and a turkey roast. About a pound and a half of each of the slices is placed into ziplock freezer bags. One or two bags are used right away, the other frozen. It's not perfect to freeze the meats, but I believe they are still better than deli. If you don't have a slicer, you can cut by hand - as long as you have a good, sharp chef's knife. You'll just get thicker slices. A good slicer can be bought for less than $100. Mine is already way over 10 years old, and is used for more than lunch meat, so one shouldn't argue that the cost of the slicer has to be recouped quickly for the lunch meat saving proposition. I don't use the slicer for cheeses. A good hand slicer is quick, quite adequate and is thrown into the dishwasher. 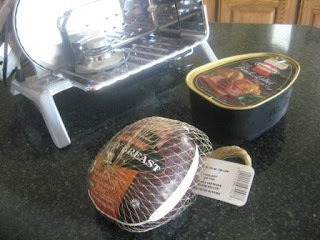 The turkey is one step harder than ham, as you have to cook it first. However roast turkey breast is so simple, and the results so dramatically better than deli products, that you may convert to this approach after just one try. Be sure to buy fresh turkey breast, not a vacuum packed frozen breast, as shown in the picture above. They're OK, but almost 50% of the product is water in the package, or that will cook out. I weighed the one above at several steps in the process. Very disappointing. A 40 ounce package yielded 24 ounces of meat. 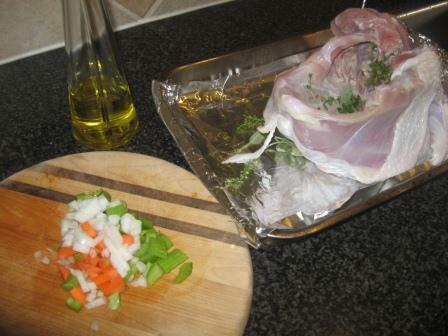 Season the turkey with salt, pepper and a drizzle of olive oil. Chop one large carrot, one celery stalk and half an onion into coarse pieces. 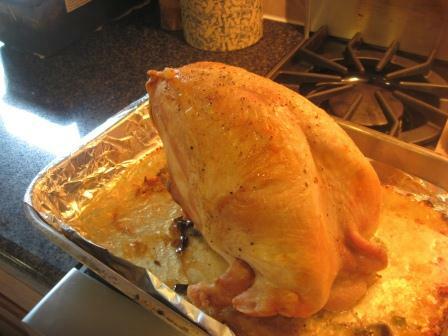 Place half on the bottom of a roasting pan, half onto the inner side of the breast. Place the turkey breast side down onto the vegetables in the roasting pan. Place 2-3 fresh thyme sprigs, or 1 teaspoon dried thyme atop the vegetables on the turkey. Roast for 20 minutes at 425 degrees. Flip turkey over and reduce heat to 350 degrees. Continue to roast until internal temperature is 165 degrees or higher. Remove and let rest 20 minutes or more. Fresh Roast Turkey Breast: $3.49 per pound or less, not boneless. After boning and wastage, cost will typically be about $4.50-$5.00, at an everyday non-sale price. Homemade bread: three loaves, about 1.5 times the yield of a standard sliced loaf: 80 cents.